We launched LandscapeHub one year ago with a simple goal: Build a one-stop online resource to quickly connect buyers and suppliers in the landscaping industry. Over this past year, we’ve used your feedback to improve the site to give you the best possible experience. We sat down with our very own Business Analyst & Market Administrator, Emily Stuart, for a quick chat about what makes the landscapehub.com dashboard a valuable tool for users, and improvements that are on the horizon. What makes LandscapeHub's dashboard unique for the green industry? LandscapeHub’s online tools allow you to conceptualize all your landscaping jobs and streamline the purchasing and pickup process, even when it’s multiple orders from multiple vendors at multiple times. How did you determine what the landscapehub.com dashboard would feature? Years of experience in this industry. The order process has always required so many phone calls, even when working with just ONE supplier. Imagine how many phone calls had to occur when dealing with multiple orders from more than one vendor. The whole point of LandscapeHub was to streamline what has up until now been an extremely painful process. We knew there was a piece of the existing order flow that deserved more detail, and more transparency for the customer, so they felt more in control. The tools on our site give buyers confidence and peace of mind by letting them know where their orders are and how they’re moving. What was the biggest improvement made to the LandscapeHub dashboard over this first year? Greater overall visibility. The early version of our order fulfillment process was a radical departure from the status quo. It did all the heavy lifting for the buyer, but historically, buyers are used to being highly involved in every step of the process. We listened to their feedback, and knew we needed to shine a light on what happens behind the scenes. The updated dashboard lets buyers track the movements of their order with a fraction of the usual time and energy required. Users can now manage orders, view their entire order history, and do status checks on recently placed orders. All of that information is visually available as it is on sites like Amazon. And, we have a few other features that will be available later this year. This spring we’ll be adding even more detailed order tracking, so you can get real-time updates on your product delivery. We’ll also be adding a tasks feature that will allow us to work with you to edit or adjust parts of your order-in-progress. Our hope is that this makes the LandscapeHub experience even faster and smoother for users. 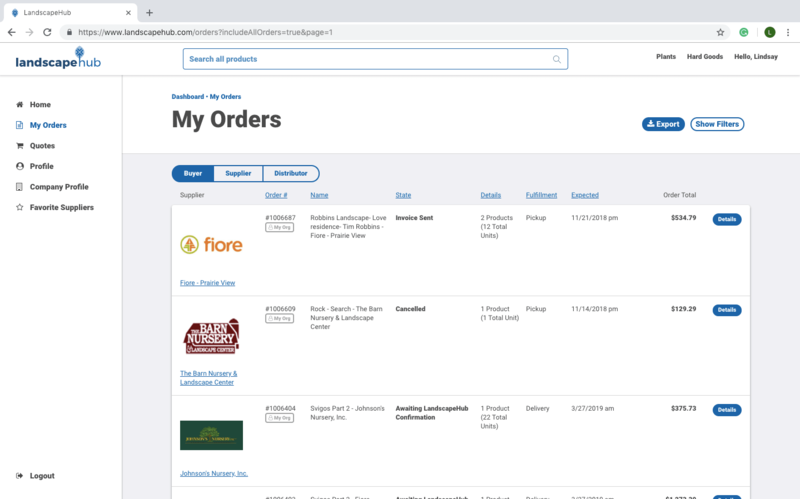 Something else coming soon is the ability to give site users an overview report of their order history and pickup or delivery schedules. Think of it as a snapshot of their complete LandscapeHub activity. It will quickly show them what they ordered this week and when they can expect it to arrive, or when they can go get any orders they placed for pickup. This snapshot will also provide financial reports that take what they’ve purchased over a certain time frame and show what they’ve paid for as well as what orders are still outstanding. This will help them see the financial status and let them know which bills to anticipate and when. If people have suggestions on ways to improve the dashboard further or questions about LandscapeHub in general, can they pass them along to you and the team? Yes, they can! We have a dedicated email for just that: support@landscapehub.com. We’re always monitoring that inbox and respond as quickly as we can. And it’s not just for dashboard improvements. LandscapeHub users can email us about everything from questions about invoicing to order specifics. And if you’ve never used our site before, you can email us your questions about the site in general! To experience the streamlined, efficient LandscapeHub dashboard firsthand, sign up today at landscapehub.com. 2018 Landscaping Trends—Which Ones Came True? Winter can leave plants susceptible to disease, but by taking the right steps ahead of time, you can fend them off and keep your plants on the right track for spring. Which landscape design trends actually happened in 2018? We explore seven predictions that experts made at the beginning of the year and whether they came to fruition.